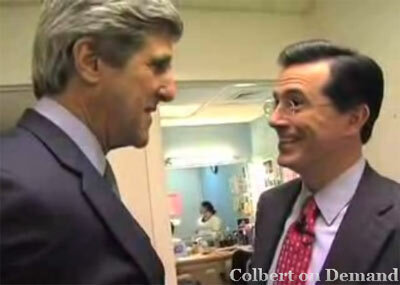 For those who haven’t had the pleasure of meeting Stephen Colbert in person, this backstage video of him prepping John Kerry before Kerry’s recent Colbert Report appearance is a fun little peek behind the curtain of the character he plays on his show. I think knowing what a charming, mild-mannered, and self-effacing person Stephen is in real life actually adds a lot to the entertainment value of watching him play his “Stephen Colbert” character. Anyway, click the image to go watch the video. I haven’t seen Mr. Colbert in person since 1995, when The Neo-Futurists were in Aspen for the U.S. Comedy Arts Festival and Stephen was there with some of his cohorts from Exit 57 and we all got to stay at the same cutesy little B&B on HBO’s dime. But for those unfamiliar with Neo-Futurist folklore, Stephen was actually an official member of the company for about five minutes. He actually participated in one rehearsal for Too Much Light, and wrote a very funny script for the show, but then he got a last-minute hail-mary promotion from Second City â€” someone there evidently realized they were on the brink of losing one of their brightest young lights to a bunch of scruffy storefront roustabouts with a hyphenated name. So between the Tuesday rehearsal and the Friday show, Stephen apologetically bowed out of Too Much Light so he could continue rocketing to fame. We were much bummed to lose him, but we all understood his decision. The piece Stephen wrote for Too Much Light â€” a hyperbolic rant in which he berated another performer (the late Ted Bales, if I recall correctly) for being colossally, even metaphysically, wrong about something or other — was an interesting foreshadowing of his Colbert Report persona. I wish I had a copy of the script â€” it’d probably be worth a bazoollian clams on eBay! â€” but I wasn’t in that piece, so I never got a copy of it. (Hey, copies were expensive and we were fresh-out-of-college actors and playwrights. So we generally only made enough for the performers in each given piece.) Too bad for posterity. … Obviously, nobody’s ever going to hire me to write for some sleazy muckraking tabloid, because I would stink at that job. He’s so delightfully droll and deadpan…very clever to watch! I liked him on Exit 57, to0. My favorite memory was of him and Amy Sedaris playing these “couples sexual counselors.” They went to demonstrate techniques and when they undressed, they were totally covered in hair. And of course, who didn’t love Mr. Noblet? Especially his recitation of the Langston Hughes poem, with the electro-robot dance afterwards.